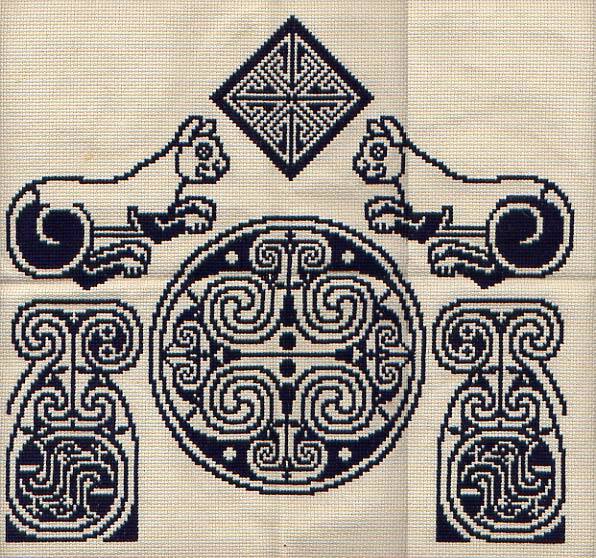 Finished Size: 11.75" x 11.25"
Eager to try out a new pattern-book, I designed this piece to show off different styles of Celtic motifs. The entire thing is done as a horizontally-symmetric pattern, transferred by hand from the book into a computer bitmap. That process alone took hours of work at the computer center, and because of the software I was using at the time (xbm on X-Windows), there were no gridlines, which made reading the pattern a tricky business. In fact, there are several spots where I misread the pattern during stitching, generating little "impurities" that I tend to think of as a dash of necessary chaos. Nearly every project I've ever done that has symmetry has a few such deviations from the pattern, which just add to the uniqueness, I suppose. 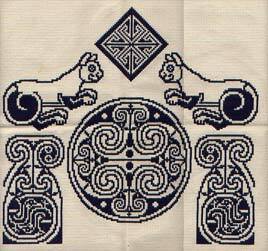 There are four distinct motifs: a central scrollwork disk, two sinuous cats, two stylized pillars, and a central sun-like geometric diamond. Selecting the motifs for this project was a lot of fun since I just picked items out of the book that I liked, and which seemed to work well together. In the final pattern, I did have an additional knotwork square to be used in the top corners, but I dropped it after stitching the rest of the design. One small problem though, that often happens in pattern-books, small portions of one motif were covered by another motif, or by a label. In that case, a little creativity, guided by the exposed part of the picture, let me fill in the hidden part. A little bit of individuality added to the mix, again.